"Apart from the most holy solemnity commemorating our Savior's birth, the Church keeps the birthday of no other person except that of John the Baptist. [The feasts of the Immaculate Conception and of the Nativity of the Blessed Virgin had not yet been introduced.] In the case of other saints or of God's chosen ones, the Church, as you know, solemnizes the day on which they were reborn to everlasting beatitude after ending the trials of this life and gloriously triumphing over the world. "For all these the final day of their lives, the day on which they completed their earthly service is honored. But for John the day of his birth, the day on which he began this mortal life is likewise sacred. The reason for this is, of course, that the Lord willed to announce to men His own coming through the Baptist, lest if He appeared suddenly, they would fail to recognize Him. John represented the Old Covenant and the Law. Therefore he preceded the Redeemer, even as the Law preceded and heralded the new dispensation of grace." In other words, today's feast anticipates the feast of Christmas. Taking an overall view, we keep during the course of the year only two mysteries, that of Christ's Incarnation and that of His Redemption. The Redemption mystery is the greater of the two; the Incarnation touches the human heart more directly. To the Redemption mystery the entire Easter season is devoted, from Septuagesima until Pentecost; and likewise every Sunday of the year, because Sunday is Easter in miniature. The Christmas season has for its object the mystery of God-become-Man, to which there is reference only now and then during the remaining part of the year, e.g., on Marian feasts, especially that of the Annunciation (March 25) and today's feast in honor of the Baptist. In a sense, then, we are celebrating Christ's incarnation today. The birth of Jesus is observed on December 25 at the time of the winter solstice, while the birth of His forerunner is observed six months earlier at the time of the summer solstice. Christmas is a "light" feast; the same is true today. The popular custom centering about "St. John's Fire" stems from soundest Christian dogma and could well be given renewed attention. St. John's Fire symbolizes Christ the Light; John was a lamp that burned and shone. We Christians should be the light of the world. We are given the story of the ministry of John the Baptist, called the Precursor or Forerunner of the Lord, with some variation of detail, in the three synoptic Gospels of Matthew, Mark, and Luke, as well as in the Book of John. Luke tells us of the birth of John the Baptist in a town of Judaea, about six months before the birth of the Saviour. The attendant circumstances, which we have already recounted under the headings of and , his parents, suggest the miraculous and wonderful. 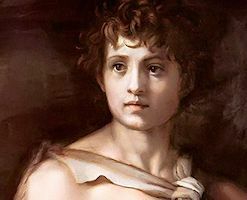 The New Testament tells us nothing of John's early years, but we know that his pious, virtuous parents must have reared the boy with care, conscious always of the important work to which he was appointed, and imbuing him with a sense of his destiny. When John began final preparations for his mission, he was probably in his thirty-second year. He withdrew into the harsh, rocky desert beyond the Jordan to fast and pray, as was the ancient custom of holy men. We are told that he kept himself alive by eating locusts and wild honey and wore a rough garment of camel's hair, tied with a leathern girdle. When he came back to start preaching in the villages of Judaea, he was haggard and uncouth, but his eyes burned with zeal and his voice carried deep conviction. The Jews were accustomed to preachers and prophets who gave no thought to outward appearances, and they accepted John at once; the times were troubled, and the people yearned for reassurance and comfort. So transcendant was the power emanating from the holy man that after hearing him many believed he was indeed the long-awaited Messiah. John quickly put them right, saying he had come only to prepare the way, and that he was not worthy to unloose the Master's sandals. Although his preaching and baptizing continued for some months during the Saviour's own ministry, John always made plain that he was merely the Forerunner. His humility remained incorruptible even when his fame spread to Jerusalem and members of the higher priesthood came to make inquiries and to hear him. "Repent, for the Kingdom of Heaven is at hand,"-this was John's oft-repeated theme. For the evils of the times his remedy was individual purification. "Every tree," he said, "that is not bringing forth good fruit is to be cut down and thrown into the fire." The reformation of each person's life must be complete—the wheat must be separated from the chaff and the chaff burned "with unquenchable fire." The rite of baptism, a symbolic act signifying sincere repentance as well as a desire to be spiritually cleansed in order to receive the Christ, was so strongly emphasized by John that people began to call him "the baptizer." The Scriptures tell us of the day when Jesus joined the group of those who wished to receive baptism at John's hands. John knew Jesus for the Messiah they had so long expected, and at first excused himself as unworthy. Then, in obedience to Jesus, he acquiesced and baptized Him. Although sinless, Jesus chose to be baptized in order to identify Himself with the human lot. And when He arose from the waters of the Jordan, where the rite was performed, "the heavens opened and the Spirit as a dove descended. And there came a voice from the heavens, Thou art my beloved Son, in Thee I am well pleased" (Mark i, 11). John's life now rushes on towards its tragic end. In the fifteenth year of the reign of the Roman emperor, Tiberias Caesar, Herod Antipas was the provincial governor or tetrarch of a subdivision of Palestine which included Galilee and Peraea, a district lying east of the Jordan. In the course of John's preaching, he had denounced in unmeasured terms the immorality of Herod's petty court, and had even boldly upbraided Herod to his face for his defiance of old Jewish law, especially in having taken to himself the wife of his half-brother, Philip. This woman, the dissolute Herodias, was also Herod's niece. Herod feared and reverenced John, knowing him to be a holy man, and he followed his advice in many matters; but he could not endure having his private life castigated. Herodias stimulated his anger by lies and artifices. His resentment at length got the better of his judgment and he had John cast into the fortress of Machaerus, near the Dead Sea. When Jesus heard of this, and knew that some of His disciples had gone to see John, He spoke thus of him: "What went you to see? A prophet? Yea, I say to you, and more than a prophet. 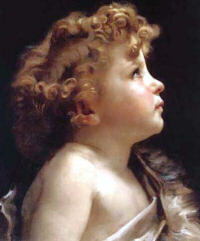 This is he of whom it is written: Behold I send my angel before thy face, who shall prepare thy way before thee. For I say to you, amongst those that are born of women there is not a greater prophet than John the Baptist" (Matthew xi, 10-12). Herodias never ceased plotting against the life of John, who was not silenced even by prison walls. His followers now became even more turbulent. To Herodias soon came the opportunity she had long sought to put an end to the trouble-maker. On Herod's birthday he gave a feast for the chief men of that region. In Matthew xiv, Mark vi, and Luke ix, we are given parallel accounts of this infamous occasion which was to culminate in John's death. At the feast, Salome, fourteen-year-old daughter of Herodias by her lawful husband, pleased Herod and his guests so much by her dancing that Herod promised on oath to give her anything that it was in his power to give, even though it should amount to half his kingdom. Salome, acting under the direction and influence of her wicked mother, answered that she wished to have the head of John the Baptist, presented to her on a platter. Such a horrible request shocked and unnerved Herod. Still, he had given his word and was afraid to break it. So, with no legal formalities whatever, he dispatched a soldier to the prison with orders to behead the prisoner and return with it immediately. This was quickly done, and the cruel girl did not hesitate to accept the dish with its dreadful offering and give it to her mother. John's brief ministry was thus terminated by a monstrous crime. There was great sadness among the people who had hearkened to him, and when the disciples of Jesus heard the news of John's death, they came and took the body and laid it reverently in a tomb. Jesus, with some of his disciples, retired "to a desert place apart," to mourn. The Jewish historian Josephus, giving further testimony of John's holiness, writes: "He was indeed a man endued with all virtue, who exhorted the Jews to the practice of justice towards men and piety towards God; and also to baptism, preaching that they would become acceptable to God if they renounced their sins, and to the cleanness of their bodies added purity of soul." Thus Jews and Christians unite in reverence and love for this prophet-saint whose life is an incomparable example of both humility and courage. Symbols: Lamb; lamb on a book of seven seals; locust; camel's hair tunic; girdle; his head on a charger; scroll with words Ecce Agnus Dei or with Vox Clamantis in deserto; long, slender cross-tipped staff; open Bible; banner of victory. The Liturgy of the Hours for the Evening Prayer (Vespers) of the Birth of St. John the Baptist has traditionally included the Gregorian chant Ut Queant Laxis. Tradition has ascribed the hymn to a Paul Warnefried (Paul the Deacon, 730-799). While preparing to sing the Exsultet at the Holy Saturday vigil, he found himself hoarse, and so prayed to St. John the Baptist, since his father lost his voice before John was born. Paul's voice was restored and he wrote this hymn in honor of the saint. True or not, what makes this song memorable is that the Benedictine monk used this hymn as a pivotal reference for our musical scale. See Catholic Encyclopedia's entry Ut Queant Laxis, more information on the hymn from Catholic Culture, a Beginner's Guide to Modal Harmony, and Gregorian Chant Notation. The Church year has two cycles. The more important cycle is the Temporal Cycle (from the Latin tempus which means time or season). The life of Christ is relived in liturgical time, in both real time and Church's memory. Throughout the year the Paschal Mystery (Christ's work of redemption through His birth, life, passion, death, and resurrection and ascension) is relived, and broken down into the seasons of Advent, Christmas, Lent, Holy Week, Easter and Ordinary Time. Sundays are the usual means by which this cycle unfolds. At the same time with the Temporal Cycle, the Sanctoral Cycle (from the Latin sanctus which means saint) progresses. The Church honors Mary, Mother of God "with a special love. She is inseparably linked with the saving work of her son" (CCC 1172). Then the memorials of martyrs and other saints are kept by the Church. They are held up to us as examples "who draw all men to the Father through Christ, and through their merits she begs for God's favors" (CCC 1173). This is one of the few saint feast days that is connected with the temporal calendar, not the sanctoral calendar, because John the Baptist was intimately involved in Christ's work of redemption. Charting or making your own liturgical calendar would be a great family project. In Brazil, this day is known as Diário de Sáo Joáo (Saint John's Day). The festivities are set off in the villages and countryside by the Fogueira de Sáo Joáo (bonfire) on St. John's eve. Families and friends eat traditional foods around the fire while younger folks jump over the fire and firecrackers are exploded. The day is primarily a festival for children, who save up months in advance to purchase fireworks to set off for the day. In cities this is a day for parties and dances, with the urban dwellers dressing up in rural costumes. St. John is the protector of lovers, so for fun, young country girls in Brazil will roll up scraps of paper, each bearing a name of a single girl and place them into a bowl of water. The first one which unfolds indicates the girl who will marry first. St. Luke tells us in his Gospel that John was conceived in a miraculous manner and that his parents were Zachary and Elizabeth. He spent his youth in the desert, and at the age of 30 came to Judea and preached near the Jordan. He exhorted the people to do penance because the kingdom of God was at hand. He baptized the Savior in the Jordan. He rebuked Herod Antipas for taking to himself Herodias, the wife of his brother Philip; at the request of the dancing daughter of Herodias he was imprisoned and beheaded. 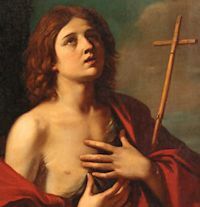 John the Baptist is the only saint whose birthday is observed by the Church; he is the only saint who was cleansed from original sin in his mother’s womb and who consequently was holy at his birth. The Gospel describes the joy caused by his birth, and recalls that at the circumcision he did not receive the name of his father, as was customary among the Jews, but the name designated by the angel. He was to be the precursor of the Lord, a mission prefigured by that of Isaias and destined for him by God even before his birth. The Introit tells us that God made John’s “mouth like a sharp sword.” John was uncompromising in his attitude towards sin, condemned fearlessly his incredulous and adulterous generation, and accepted martyrdom rather than flatter or condone the vices of the rich and the mighty.